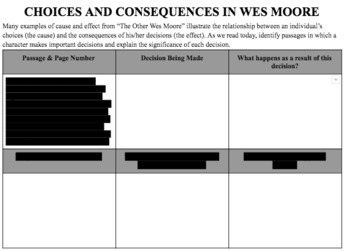 Choices & Consequences in "The Other Wes Moore"
Worksheet allows students to reflect on the relationship between choices (cause) and consequences (effect) in "The Other Wes Moore". Worksheet can be used at any point in the novel and has one passage pre-filled to use while modeling with the class. Can be completed individually or as a class.